Our annual Christmas Concert at the Woodmead Halls this afternoon went really well. The hall was packed and we were very pleased to welcome the Mayor, Councillor Michaela Ellis accompanied by Councillor Cheryl Reynolds, our President, Councillor Owen Lovell and his wife, residents from Shire House and Tree Tops Care Home, and friends, family and supporters of the band. Our guest artists proved to be very popular. Local writer and poet, David Ruffle, resplendent in his first ever Christmas jumper, read two poems he had penned especially for the occasion and the audience was also entertained by The Four Tuner Tellers, a Barber Shop Quartet from the parish of All Saints, near Axminster. The catch was that in fact they were a trio instead of a quartet due to illness. However, their voices blended together beautifully and they finished their performance by cajoling the audience into joining in a lively rendition of The Twelve Days of Christmas complete with actions. The audience also took part in some carol singing. Our training band played several short pieces and are gaining in confidence each time they perform. Following their performance Jonathan, who played trombone, was presented with the Chairman’s Award as the most improved young player. There was another award winner – our conductor, David Tozer. David did a fantastic job leading the band this afternoon, as well as compering the concert, and he was presented with the Gordon Broom Award. 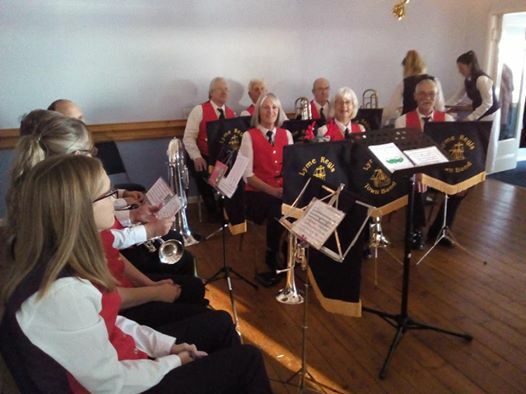 All in all it was a very enjoyable afternoon and we are very grateful to everyone who attended and supported the band.The photo above was taken by Josie and Klara Smith, daughters of our solo cornet, Kathy Smith. What a lovely evening we had tonight at All Saints. The village hall was packed. There was a very varied programme of entertainment, including some lovely singing by the children from the local primary school, hand bell ringers, a saxophone group, singers, a poetry reading and the local WI sang a farewell number as they are about to disband and reform. The band was conducted on this occasion by David Tozer, and we played several pieces – but one of the highlights of the evening for us was the appearance of three members of our Training Band, two of whom were performing in public for the first time. 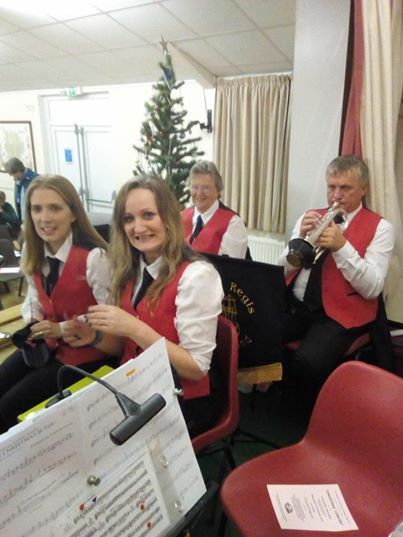 They played three numbers led by their tutor, Ellis Holt, and supported by solo cornet, Kathy Smith, and their performance was warmly received by the audience. Also warmly applauded was a solo rendition of My Old Kentucky Home played beautifully by Ellis. The concert concluded with everyone singing The Twelve Days of Christmas. It was a super evening and the best bit is that we’ve been booked to play again next year. I managed to get a photo of the cornets this time……. 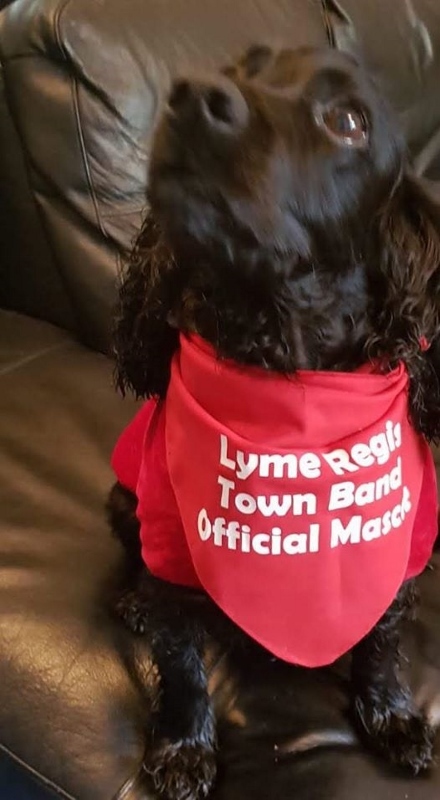 We’ve not only gained a new Secretary but we’ve also now a band mascot! The lovely Lilli is owned by Sandra and her husband, Lloyd, and comes complete with her own uniform. Lilli visits us at band practice with Sandra and even sat in on a recent committee meeting – that’s bordering on cruelty to animals! She’s an absolute poppet and we are pleased to have her. When she’s not too busy Lilli will join our team of collectors when we are out and about with our buckets. We’re sure she’s going to be very popular with our audiences. Today we played at the Remembrance Service at St Michael’s Church in Lyme Regis. The church was packed, with standing room only. All local organisations were represented and we were very pleased to take part. This service is always very moving but was particularly poignant this year as it was the last service conducted by Rev Jane Skinner who is shortly leaving the area with her husband, Rev Stephen Skinner. Jane has always been very welcoming to the band and we wish her every success in her new parish. Following the service the parade moved to Cobb Gate where two minutes’ silence was observed and Last Post and Reveille were played to perfection by David Tozer. Luckily the rain held off and we all managed to stay dry. Special mention to Alison Davies who conducted the band today. We are most grateful to her for her support – she did a fantastic job and we loved having her with us. Happy Birthday to our trainee Enzo who has just had his 9th birthday. We’ve not forgotten you – as its half term we’ve put your card in the post. Have a lovely day and see you soon, back at practice getting ready for the trainee band’s next appearance at our Christmas Concert on Sunday, 16th December. 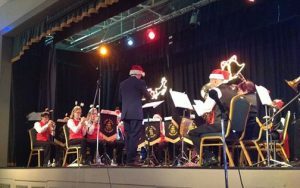 Congratulations to the Lyme Regis Branch of the Royal British Legion for organising a spectacular Festival of Remembrance Concert at the Woodmead Halls. The entertainment was varied, including local singing group Harbour Voices, talented soloist Harvey Causley, who was representing local youth music group BSharp, readings by Alexandra Wood and David Ruffle, who had both penned very moving poems and a splendid piper, Scott Graham. The evening also included the Parade of British Legion Standards, always a stirring movement, plus the Service of Remembrance which featured The Last Post and Reveille as the red poppies fell and concluded with a rendition of I Vow to Thee, my Country sung by Helen Webber followed by the band playing Sunset and Land of Hope and Glory. It was a super evening – our pieces included Westward Ho!, London River and Bandology and several singalong numbers. Catherine Lancaster performed Share My Yoke beautifully and Bob Lovett made an excellent job of Last Post and Reveille. 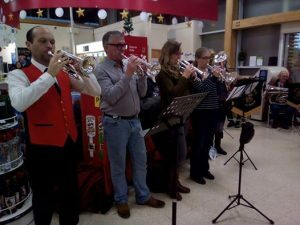 We were very pleased to have some guest players with us – Malcolm Caddy on Euphonium and Laura Caddy, Geoff Davis and Bob on cornet and we are very grateful to them for their help. Last, but not least, the band was conducted by David Tozer who did an amazing job. This concert can be a bit fraught for the Conductor as we are playing bits and pieces throughout the evening, as well as our set numbers. However David was on top of things throughout and we all benefited from his quiet confidence. Thank you, David! All in all it was a lovely evening, in aid of a good cause, and the band was delighted to be part of it. We had a very productive committee meeting earlier this month which included looking at the first draft of our engagement list for next year. Forward planning is the name of the game. We’ve had several requests to attend events in the local area so we hope to add these to our list of regular commitments. Plans are underway for our Christmas Concert and we’ve managed to persuade a Barber Shop Quartet from All Saints to join us as guest artists this year. They are called The Four Tune Tellers and having seen them perform we know they will go down well with our audience. The best bit of news is that we now have a volunteer willing and able to help us with our admin. Sandra attended the committee meeting and is now working alongside myself with a view to taking over when I stand down as Secretary at the AGM in January. She is super efficient and is already working on the poster and tickets for our Christmas Concert. The committee is going to be in good hands and we are very grateful to her for offering to help us. Good news – we now have an adult learner in our training band – Mark, who is learning to play euphonium. It would be lovely if we had some other adults willing to learn as its always more fun to learn alongside other people. We have instruments available so if anyone is interested please feel free to come along for a chat. You would be made very welcome, especially by Mark! The training band meets at Woodmead Halls on Tuesday evenings at 7.00 pm and is led by Ellis who is an excellent and very patient teacher. At the end of their practice the trainees join the main band to play a few hymns. We even had chocolates last night, courtesy of Jane, who gave them to us as a leaving present. Sad to see her go but the chocs were delicious!